Description: OEM SPEC BELT MURRAY / 37X43 Replaces (OEM): MURRAY 24304 MURRAY 37X27 MURRAY 37X39 MURRAY 37X43 Fits Models: MURRAY 36" cut, rear and side discharge Application: BLADE Length: 82 1/2" Width: 1/2" Aftermarket Belt Fits Murray Lawn Mower. 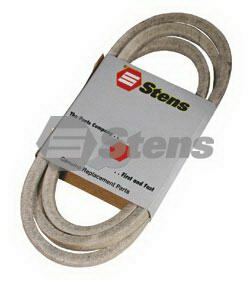 Description: OEM SPEC BELT MURRAY / 37X45 Replaces (OEM): MURRAY 37X35 MURRAY 37X45 Fits Models: MURRAY Uni-frame lawn tractors with Peerless transaxle 1982-1988 Application: Motion Drive Length: 90 1/2" Width: 1/2" Aftermarket Belt Fits Murray Lawn Mower. Description: OEM SPEC BELT MURRAY / 37X57 Replaces (OEM): MURRAY 37X57 Fits Models: MURRAY 30" cut Application: Blade Length: 53 1/2" Width: 1/2" Aftermarket Belt Fits Murray Lawn Mower. Description: OEM SPEC BELT MURRAY / 37X61 Replaces (OEM): MURRAY 37X61 MURRAY 710531 Fits Models: MURRAY 38", 40", 42" and 46" cut lawn tractors 1989-1995; 30" cut lawn tractors 1992-1995 Application: Motion Drive Length: 95 1/2" Width: 1/2" Aftermarket Belt Fits Murray Lawn Mower. Description: OEM SPEC BELT MURRAY / 37X62 Replaces (OEM): MURRAY 37X62 Fits Models: MURRAY 40" side discharge lawn tractors Application: Blade Length: 86" Width: 1/2" Aftermarket Belt Fits Murray Lawn Mower. Description: OEM SPEC BELT MURRAY / 37X63 Replaces (OEM): MURRAY 37X63 Fits Models: MURRAY 1989 12 HP 38" cut Application: Blade Length: 83" Width: 1/2" Aftermarket Belt Fits Murray Lawn Mower. Description: OEM SPEC BELT MURRAY / 37X64 Replaces (OEM): MURRAY 37X64 Fits Models: MURRAY 21" Aerovac Application: Motion Drive Length: 36 1/2" Width: 1/4" Aftermarket Belt Fits Murray Lawn Mower. Description: OEM SPEC BELT MURRAY / 37X65 Replaces (OEM): MURRAY 37X65 Fits Models: MURRAY 1990 and newer, 25" and 30" cut rear engine riders with transaxle Application: Motion Drive Length: 30" Width: 1/2" Aftermarket Belt Fits Murray Lawn Mower. Description: OEM SPEC BELT MURRAY / 37X66 Replaces (OEM): MURRAY 37X66 MURRAY 710216 Fits Models: MURRAY 46" 1990 and newer; Scotts 46" LT rail frame Application: Cross Drive Length: 47" Width: 1/2" Aftermarket Belt Fits Murray Lawn Mower. 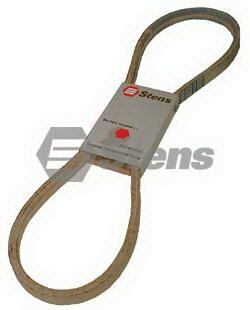 Description: OEM SPEC BELT MURRAY / 37X69 Replaces (OEM): MURRAY 37X69 Fits Models: MURRAY 46" cut 16 HP; lawn tractors 18 HP, 46300 series 1990-1998 garden tractors Application: Primary Mower Drive Length: 80 1/2" Width: 1/2" Aftermarket Belt Fits Murray Lawn Mower. Description: OEM SPEC BELT MURRAY / 37X70 Replaces (OEM): MURRAY 37X70 Fits Models: MURRAY 1990 and newer 46" cut Application: Blade Length: 76 1/2" Width: 1/2" Aftermarket Belt Fits Murray Lawn Mower. Description: OEM SPEC BELT MURRAY / 37X74 Replaces (OEM): MURRAY 37X74 Fits Models: MURRAY 30" mulching mower Application: Blade Length: 56 3/4" Width: 1/2" Aftermarket Belt Fits Murray Lawn Mower. Description: OEM SPEC BELT MURRAY / 37X75 Replaces (OEM): MURRAY 37X75 Fits Models: MURRAY 1993 42" cut Application: Blade Length: 91" Width: 1/2" Aftermarket Belt Fits Murray Lawn Mower. Description: OEM SPEC BELT MURRAY / 37X76 Replaces (OEM): MURRAY 37X76 Fits Models: MURRAY 42" GT and LTX rider models with 12.5 thru 18 HP engines Application: Blade Length: 93 1/4" Width: 1/2" Aftermarket Belt Fits Murray Lawn Mower. Description: OEM SPEC BELT MURRAY / 37X80 Replaces (OEM): MURRAY 37X80 Fits Models: MURRAY 40", 42" and 46" lawn tractor with Dana transmissions Application: Drive Length: 86" Width: 1/2" Aftermarket Belt Fits Murray Lawn Mower. Description: OEM SPEC BELT MURRAY / 37X81 Replaces (OEM): MURRAY 37X81 Fits Models: MURRAY 42" and 46" garden tractors with Dana transmissions Application: Drive Length: 89" Width: 1/2" Aftermarket Belt Fits Murray Lawn Mower. Description: OEM SPEC BELT MURRAY / 37X84 Replaces (OEM): MURRAY 37X84 Fits Models: MURRAY Scotts 21" mower Application: Drive Length: 35" Width: 3/8" Aftermarket Belt Fits Murray Lawn Mower. Description: OEM SPEC BELT MURRAY / 37X86 Replaces (OEM): MURRAY 37X86 Fits Models: MURRAY 38" LT rail frame Application: Deck Length: 84 1/2" Width: 1/2" Aftermarket Belt Fits Murray Lawn Mower. Description: OEM SPEC BELT MURRAY / 37X87 Replaces (OEM): MURRAY 37X87 MURRAY 710341 Fits Models: MURRAY 42516X92B Application: Drive Length: 97 1/2" Width: 1/2" Aftermarket Belt Fits Murray Lawn Mower. Description: OEM SPEC BELT MURRAY / 37X88 Replaces (OEM): MURRAY 37X88 MURRAY 710213 Fits Models: MURRAY 42" LT rail frame models 42509X92B and 42590X92A; Scotts 42" LT rail frame SCOTTS 42" LT rail frame Application: Deck Length: 89 1/2" Width: 1/2" Aftermarket Belt Fits Murray Lawn Mower. Description: OEM SPEC BELT MURRAY / 37 X 89 Replaces (OEM): MURRAY 37X89 MURRAY 710217 Fits Models: MURRAY 46" LT rail frame; Scotts 46" LT rail frame SCOTTS 46" LT rail frame Application: Deck Length: 87" Width: 1/2" Aftermarket Belt Fits Murray Lawn Mower. Description: OEM SPEC BELT MURRAY/37X90 Replaces (OEM): MURRAY 37X90 Fits Models: MURRAY Scotts 21" mower Application: Drive Length: 36 1/2" Width: 1/4" Aftermarket Belt Fits Murray Lawn Mower. Description: OEM SPEC BELT MURRAY / 37X93 Replaces (OEM): MURRAY 37X93 MURRAY 710533 Fits Models: MURRAY 48", 50" and 52" GT rail frame; Scotts 50" LT rail frame SCOTTS 50" LT rail frame Application: Primary Blade Length: 110 1/2" Width: 5/8" Aftermarket Belt Fits Murray Lawn Mower. Description: OEM SPEC BELT MURRAY / 37X96 Replaces (OEM): MURRAY 37X96 Fits Models: MURRAY 46" GT rail frame Application: Deck Length: 88 1/2" Width: 1/2" Aftermarket Belt Fits Murray Lawn Mower. Description: OEM SPEC BELT Replaces (OEM): MURRAY 97133 Application: Drive Length: 29 1/4" Width: 5/8" Aftermarket Belt Fits Murray Lawn Mower.